Dublin offers a wide range of hotel accommodation to suit all tastes and budgets. Only in Dublin does The Craic, the good life, not stop at the hotel door - No, The Craic takes place right inside! Hotels in Dublin have played an important part in the city's social life for more than 100 years. Depending on the occasion, Dubliners meet as likely in the hotel as in the pub. Whether it is a family celebration, a cup of tea to take a break from shopping or pre-theatre drinks, if you grew up in Dublin you will head for one of the city's hotels. And don't forget that the residents bars of Dublin's hotels are most likely the last place in town where you can get a drink after a night's celebrations. The Bewleys group runs two hotels in Dublin, one in the southern suburb of Leopardstown - near Dublin's horse racing course - and one closer to the city centre in leafy and exclusive Ballsbridge. The Ballsbridge Bewleys is located directly opposite the Four Seasons luxury hotel and close to the show grounds of the Royal Dublin Society, the RDS. Bewleys Hotel Ballsbridge takes up the spectacular red brick architectur of a former 19th century Masonic School. If you are travelling on a budget it is worth checking out Bewleys Ballsbridge as the hotel consistently offers some of the keenest room rates and family deals on Dublin's Southside. Known among Dubliners simply as 'the Burlo', the Burlington has been at the hub of Dublin society since it opened its doors in 1972. Located on Upper Leeson Street in exclusive Dublin 4, the Burlington's ballroom is the spot for major black tie and little black dress get togethers from awards shows, masked balls and sports galas to charity events. 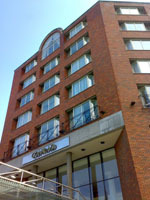 The Clarion Hotel lies in the middle of Dublin's financial district, the International Financial Services Centre or IFSC. The hotel is overlooking the River Liffey and has its own fitness centre complete with 18 metre indoor pool. If you are visiting Dublin during the annual Maritime Festival, then a stay at the Clarion Hotel will put you right in the thick of the action. The Clarion is also the nearest hotel to Dublin's largest purpose-built concert venue, the O2. The hotel is a 10 minute walk away from Connolly train station and the Red Luas tram line. The Luas rail system is currently being extended along the quays and will connect the Clarion with the O2 concert venue. The Clontarf Castle Hotel stands on historic grounds. It was here that Irish chieftain Brian Boru gave the Vikings one of their rare defeats. These days, Clontarf is a quiet, elegant seaside town full of Victorian red brick houses just to the north of Dublin's city centre. The earliest parts of Clontarf Castle date back to 1172. The main building was re-built in 1837. The castle is hidden away from the town on its own, secluded grounds and housed a cabaret for 25 years before it became a hotel in 1998. The ivy-clad exterior of Clontarf Castle houses a modern hotel that incorporates many antiques from the castle's history. There is a definite Tudor touch about the lobby and some of the main public rooms with their flagstone floors, stone walls and dark wooden beams. Clontarf Castle is located close to Eastpoint Business Park and convenient for Dublin Airport and Dublin Port. The Conrad is a modern five-star hotel located on quiet Earlsfort Terrace, just off St. Stephen's Green. Rooms at The Conrad are overlooking the National Concert Hall. The hotel is a short stroll from a secluded gem of a park, Iveagh Gardens. If you are planning to visit Dublin on St. Patricks Day, the Irish national holiday on the 17th of March, then The Conrad lies at the heart of the action. 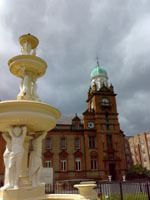 The St. Patricks Day Festival concert stage which hosts the Ceili Mor (Irish for 'Big Party') is traditionally located on Earlsfort Terrace within view - and earshot - of the hotel. The Fitzwilliam hotel is located directly on St. Stephen's Green at the heart of Dublin. A two-minute stroll from Dublin's main shopping mile, pedestrianised Grafton Street, the Fitzwilliam is a popular meeting spot with its three restaurants, which include the Michelin star bearing Thorntons. Under the direction of chef Kevin Thornton, the restaurant is a favourite with Dublin foodies. Founded in 1817, The Gresham is a Dublin institution on O'Connell Street. The only four star hotel on Dublins main north-south thoroughfare, The Gresham is a popular spot for lunch or afternoon tea. The hotel lies across the road from the General Post Office, the setting for the Easter Rising of 1916, an important milestone on the way to Irish independence. The Gresham Hotel is also very convenient for the Hugh Lane Gallery and the most popular shopping area on Dublin's Northside, Henry Street. You get to feel like a well heeled Dubliner turning into the leafy residential road that leads to the Herbert Park Hotel. The hotel sits in a modern apartment complex among posh red brick terraces a few minutes' walk away from the grounds of the Royal Dublin Society, the RDS. Rooms at the Herbert Park Hotel overlook the 48 acre park of the same name. The park has a genteel, old-fashioned feel, complete with a bowling green and a duck pond. The Jurys Inns group has three hotels in Dublin: Custom House, Parnell Street and Christchurch. Jurys Inn Christchurch is the most convenient for sightseeing, situated right opposite Christchurch Cathedral and Dublinia and a short walk from Dublin Castle, St. Patrick's Cathedral, and the Guinness Storehouse. The Morgan on the fringes of Dublin's Temple Bar area packs a young, fashionable crowd into its bar. One of the most cutting edge venues in Temple Bar, The Morgan even has its own series of chill-out music compilation CDs. Upstairs from the stylish bar you will find equally cool living quarters. The Morgan's most spectacular room is the Penthouse, which gives you a unique view over the roofs of Dublin. The Penthouse at the Morgan has furniture by French designer Philippe Starck and you can entretain up to 35 guests up here. Situated right on the quays overlooking the River Liffey, the Morrison is the only boutique hotel on Dublin's Northside. The cool grey glass facade of the Morrison's ground floor bar is a landmark on the quays. A trendy young crowd gathers here in the Morrison Hotel's stark, minimalist chic. Originally designed by Irish fashion and interior design icon John Rocha, the Morrison does not only look good, it is comfortable too. The O'Callaghan group owns four hotels in Dublin: The Davenport, the Alexander, the Montclair and the O'Callaghan Stephen's Green. All hotels have four stars bar the three star Montclair. The Alexander, Davenport and Montclair are located within view of each other in a side street just off Merrion Square with its magnificient Georgian townhouses. The Stephen's green hotel is the most convenient for shopping, thanks to its location near St. Stephen's Green and the southern end of Grafton Street. Tucked away in a quiet location just off Dublin's main shopping mile, Grafton Street, The Westbury is a Dublin institution for family lunches and get-togethers. The hotel is a haven for shopaholics, situated close to Grafton Streets fashionable boutiques and boasts its own, exclusive Westbury Shopping Mall with an eclectic mix of shops from jewellers to top end kids fashions. The Westbury has recently been refurbished and now offers amenities such as complimentary high speed internet access, 32" flat screen TVs and iPod docking stations in its rooms. The Westin Hotel overlooks Trinity College and the historic Bank Of Ireland building which housed the Irish Parliament during the 18th century. The Westin is located in the opulent former headquarters of Allied Irish Bank just off College Green. The Temple Bar area starts literally on the opposite side of the road from the Hotel's main entrance. The northern end of Dublin's main shopping mile, Grafton Street, lies a five-minute stroll away.